Put the chicken, one breast at a time, into a large zip lock bag and seal. Use a mallet or cup to hammer the chicken breast flat. Repeat for each chicken breast. Crack the eggs into a bowl and mix with a fork breaking the yoke (as if you are making scrambled eggs). Lay each chicken breast in the bowl and coat with egg (you can add a bit of milk, we use unsweetened almond milk, to the eggs for easier dipping). Then lay the chicken breast flat and add a piece of ham and a piece of cheese onto the chicken breast and roll up placing in a baking dish. Sprinkle parmesan cheese over each. Bake at 350 for an hour or until golden brown and chicken is done. Eat and enjoy! We love this recipe at our house. When chicken is on sale we purchase as much as possible and make an assembly line to put them together. We then freeze them in groups of two in glass Tupperware and take out for dinner in the future. This is my family’s favorite meal, it’s simple, it’s gluten free and it’s a crowd pleaser. This is a recipe I created after being inspired by a family recipe. 1 package of Aidells chicken apple sausage (this is a family favorite, precooked and found for a great price at Costco – no MSG, No nitrates, No hormones. Aidells has many different flavors but we love this one because it does not include any added sugar. Start your water boiling for pasta – add a couple drops of oil to the water so the noodles don’t stick together. Heat a large sauce pan on low with a couple tablespoons of grapeseed oil. Chop your onion and add to the sauce pan. Sauté (sauté = to cook and make the onion softer) the onion for 5 minutes on medium heat. Then add the frozen peppers and broccoli and cover to let simmer. Put your sausage in the oven on high broil for about 10-15 minutes since you are heating the already pre-cooked sausage (turning them at 5-7 minutes). Add your pasta to the boiling water, stir and set timer according to directions on back of package. Chop the artichoke hearts and add to the sauce pan. Remove the sausage from the oven and slice. Add to the sauce pan. 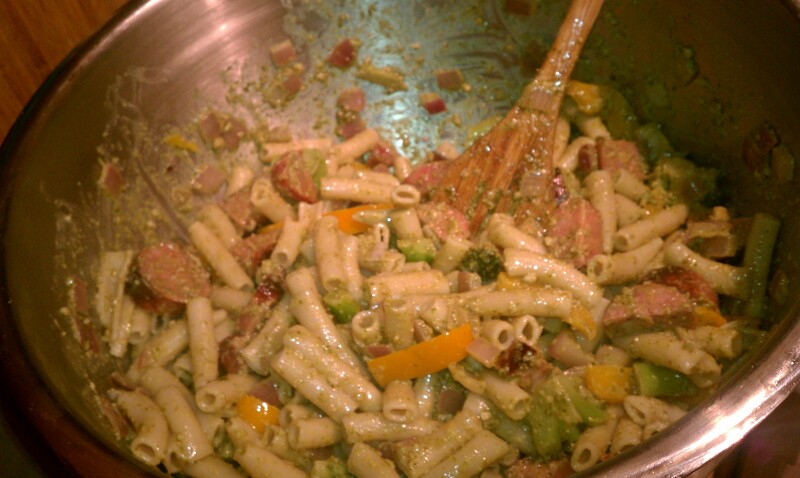 Finish and drain pasta and dump into a large bowl. Make sure all ingredients in the sauce pan are cooked (thawed and hot), stir and then dump into the big bowl on top of the pasta. Add olive oil and parmesan cheese (pesto if you choose this option) to taste, toss, serve and enjoy! If you get adventurous try adding your favorite vegetable into the mix and let me know what you add and how it turns out!